New experiences and change are familiar states to Chris Page, who at the age of 27 in 1994 was involved with founding Hoosier Harvest Church in Martinsville. Now, 20 years later, the church serves more than 500 members from a 42,000 sq. ft. building, and Chris Page is still learning from new experiences and change. 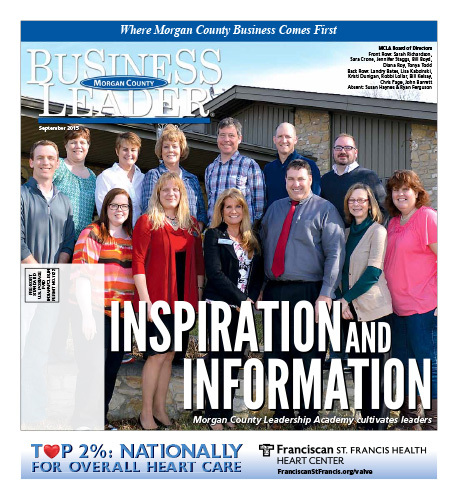 It was not that openness to learning that compelled Page to join the 2010 Class of the Morgan County Leadership Academy (MCLA). It was prodding by Jim Taylor and the respect Page had for Taylor that finally convinced him. Taylor had been through the Academy and believed in it. Page says that although he trusted Taylor’s belief in MCLA, he was doubtful about participating. His expectation was that the MCLA would require him to be in a classroom all day long once a month. “Was I wrong,” Page said. “I found out that it wasn’t that at all. With each session I liked it more and more and I was eager to get to the next one.” This was from the person who required that things he participated in “have something to catch and keep my attention, some excitement about it.” That does explain why he embraced MCLA. Participants in the Academy commit to a nine-month program from January through September with attendance required at a monthly meeting from 8 a.m. to 4 p.m. in various locations throughout the County. Each session is themed and covers topics such as history, economy and social service. “You are immersed with information,” Page said. Over the last 20 years the session material has been tweaked and refined. He said, “Every session is very interesting. And it’s not just information; it hits the emotions of the class members. Download the full September 2015 Edition here.